Oracle Responsys is an award-winning email marketing tools and functionalities that help improve conversions, strengthen customer relationships, and dramatically lessen messaging fragmentation. As Oracle Responsys works in tandem with other marketing channels including mobile, web, display and social, it provides users with wider consumer coverage and drives long term value. With Oracle Responsys, data-driven marketing teams are greatly empowered with the tools to give their users the relevant, engaging experiences cross devices, channels, and lifecycles. Deriving data from disparate sources becomes more useful and helps precisely identify targeted audiences, and then encourage consumers to create their own next experience by engaging them in near real-time. 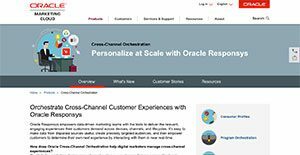 With Oracle Responsys, users don’t just get a power email marketing solution that improves revenue and forge customer relationships – they get a platform that makes orchestrating cross-channel customer experiences easy and effective. The system enables marketers to create personalized and sophisticated cross-channel consumer experience using deeply integrated and top class technologies. With industry-leading insights, marketers are more than capable of realizing business goals. Oracle Responsys provides innovative tools that are relevant to marketers and supports them with powerful infrastructure as well as unique solutions that result to huge gains and realization of goals. Every enterprise has different wants and needs a software that can be personalized for their size, kind of workers and customers, and the specific industry they are in. For these reasons, no software can offer perfect functionality out-of-the-box. When you search a software app, first be sure what you need it for. Read some Oracle Responsys reviews and ask yourself do you need basic tools or do you need sophisticated tools? Are there any industry-specific tools that you are seeking? Find the answers to these questions to aid your search. There are lots of factors that you need to mull over and these include your finances, particular business wants, your organization size, integration requirements etc. Take your time, try out a few free trials, and finally zero in on the platform that presents all that you want to enhance your company efficiency and productivity. How Much Does Oracle Responsys Cost? Pricing is available by quote only. Contact Oracle Responsys team direclty for more pricing information. We realize that when you make a decision to buy Marketing Software it’s important not only to see how experts evaluate it in their reviews, but also to find out if the real people and companies that buy it are actually satisfied with the product. That’s why we’ve created our behavior-based Customer Satisfaction Algorithm™ that gathers customer reviews, comments and Oracle Responsys reviews across a wide range of social media sites. The data is then presented in an easy to digest form showing how many people had positive and negative experience with Oracle Responsys. With that information at hand you should be equipped to make an informed buying decision that you won’t regret. What are Oracle Responsys pricing details? What integrations are available for Oracle Responsys? Pros: It has a self-service interface that allows our teams to operate the tool at their level. The cross channel capability helps our teams to communicate and work on multiple campaigns from a single platform. The real time reporting feature makes it easy to manage and monitor the email marketing campaigns. Cons: There are issues with the internal data which results to problems when you want run many automated applications for your campaign. Due to this, you are forced to manually send the email lists instead of automation. If you are dealing with many complicated marketing strategies, then you can experience delays when it comes to integrating them. Pros: It is flexible and robust in design which adds to its capabilities. This allows you to pull or get data from multiple sources such as CRM and the buying behavior of your customers. You can thus track the progress of your campaigns with the help of this tool. Responsys can also be used by expert marketers as it comes with the SQL capabilities. Cons: Some of the simple features you would expect to be intuitive for any email marketing tool, Responsys does not have. You have to set them up which can be time consuming and require training. For example, the viewing, and link tracking feature. You have to do it by yourself and thus require a marketer who is an expert in IT. The tool does not track the activities of mobile users on your site when they click on a link or the product. If you need more information about Oracle Responsys or you simply have a question let us know what you need and we’ll forward your request directly to the vendor.